Registration will continue with the Self Registration system with two touchscreen laptops. Membership cards will play an important role in your registration process this year. You will notice a bar code on your membership card, and this will be used to scan you in, and populate your rider information. Once scanned, the rider will then go through the process of verifying information like racer number and transponder number. You will then select your classes. The system will automatically print out your entry sheet with your information to hand to the registration staff. The SMA Executive and the Competition Committee has discussed some rules that will be enforced; these may differ from the CRMC rule book. 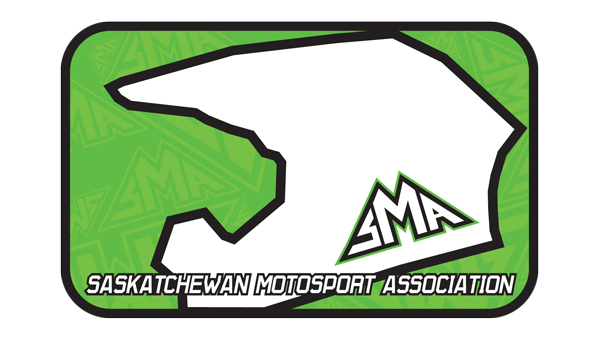 SMA rules will take precedence when racing in Saskatchewan. No riding anyone without a helmet at any time. Pit bikes or quads will be allowed at promoters discretion and everyone has to wear a helmet and at walking speed only !!! Credentials required for access to the track. Available for sign out at registration. No one will be allowed on the track without this. Fines will be assessed. Riders may ride double as long as all riders have helmets and at walking speed only !!!. Generators must be turned off at 11 p.m., subject to weather, health reasons and emergencies. Registration will be complete by 7:30 a.m. Late entries will be subject to $10 late fee. Riders Meeting is 7:40 a.m.
Evening registration before race day should be held between 6 p.m. and 9 p.m.
60 cc bikes are allowed in Supermini. 150cc four-stroke bikes are allowed in both 85cc classes. Regardless of # of entries per class, points will be awarded. 100cc two-stroke bikes can be raced in Supermini, or Junior if older than age 12. Practices are limited to one per rider, unless there is a track change for a different bike size, in which case two may be allowed (i.e. track change for 60 riders who also rides 85). Riders who ride both 85cc and 125cc bikes should ride the bigger bike for practice or as determined by the referee. The penalty for riding two practices is dockage of five positions in each class. Parents of 50cc riders must accompany riders to and from the track, and when riding anywhere in the pits. Bike numbers need to be legible and the correct color combination in which they are classified as. Riders must be 14 years old to compete on a 450cc. ALL Penalties are at the referees’ discretion. Hopefully this will answer a lot of the common questions that are asked and help you concentrate more on having fun and discovering what a great sport motocross is. This information is for local events only. Information for other associations might be different. There is a simple rule in racing, dress for the crash, not for the ride. The more gear you have on the more likely you are to go home sore than to end up in the Emergency Room. Motocross racing is not a fashion show. Amateur riders, especially young beginning riders should be more concerned with wearing as much protection as possible rather than trying to look like Ryan Villopoto. Buying safety gear is something that a good dealer can really help with. Sizes on gear vary a great deal and are not always accurate. Dealing locally will allow you to try on stuff before buying and also can help if there is a warranty problem later. Remember to consult the rulebook if you need clarification on anything from bike displacement in classes to what kind of gear is mandatory. These must always be worn at the beginning of an event, including practice. Get used to them when you practice and you will feel naked without them later. Try different brands on while wearing your helmet to find the ones that are most comfortable. Make sure you get a spare lens and some tear-offs for the wet conditions. This is the single most important piece of protection you will buy. It is recommended that you buy a good quality Helmet. Cheap helmets usually cheap quality. A helmet should be fit snug around the area wear a cap fits, but with no pressure points. The helmet should be tight on your cheeks and when you move the helmet it should move your facial skin. If it doesn’t, it is too big. It should be snug going on and off but not so tight it is uncomfortable. Gloves are required during competition events as they protect your hands from dirt and rocks (roost) that gets thrown from a bike in front of you. Also know as chest and back protectors. It is important to learn to ride with these from the beginning since they can take some getting used to later. These can help protect from an impact injury by spreading the impact over a wider area. They also protect from roost (dirt thrown up from tires). There is a huge selection of makes and models in different colors available in both body armor (front and back) and chest only protectors. Long sleeve shirts and racing pants are required to race. We also recommend buying some sort of knee pads. Most dealers sell them to go inside race pants so you will have to buy them eventually anyway. If you want to know what happens without knee pads, let a friend hit you with a hammer on the kneecap. Gloves are also recommended. Elbow pads are optional and are a good idea for beginners. It is recommended that a good quality neck protection like the Leatt o Atlas brands be used but isn’t mandatory. Remember… If you start racing with neck protection you probably will use it for the rest of your life. To race, some sort of boot that covers and supports the ankle is required. When you buy motocross boots it is important to take the time to break them in properly. If you try to race with them before they are broken in, you will have a hard time working the controls on your bike, which could result in an accident. If you are buying for your child get them a little big, but not too big, to allow for growth. If you take care of boots they will last quite awhile and then you can sell them to another rider. It is important to carefully maintain your machine. Inspect it carefully and look for any sharp edges or protruding bolts that can be eliminated to keep them from catching clothing or injuring a rider. Make sure grips are glued or wired on so that they will not come loose. Do not run broken clutch or brake levers because of the sharp point they have. Also remember that all bikes will be required to have their side stands/kick stands removed prior to competition. This is for the safety of all involved. Contact any of the executive members or the Referees if your unsure about anything. Motocross racing is a great sport. It teaches discipline, coordination, the importance of preparation, goal setting, and the satisfaction that comes from racing as well as dealing with the disappointment of working hard but coming up short. Motocross differs from a lot of sports because unlike team sports like hockey, football, soccer, etc. it is an individual sport. This can be helpful in teaching young people personal responsibility. If they set a goal and come up short there is no one else to blame. As in any sport that involves young people there are parents that sometimes push too hard for success. It is the classic “Hockey Parent Syndrome”. The difference is that if you push too hard in motocross it can result in your rider and possibly other riders getting injured. Motocross is hardly as easy as the pro riders make it look. There are skills that will develop only with time and practice. If you stand on the side of the track and yell at your rider, they will not be able to hear you and you might distract your rider and cause an accident. It’s a good idea to step back occasionally and look at racing through your child’s eyes. Remember that the most important thing in racing is to have fun. The best thing that can prepare you for racing is riding. When you go out to ride don’t just ride in circles all day. There are different things you can do to improve basic riding skills. Practice riding wheelies and doing power slides. Concentrate on using different controls like the clutch, front and rear brakes, etc. so that you will know their limits. Using the clutch will help you attack corners harder. Proper use of the brakes will shave seconds off your lap time. While jumping is important in Motocross, races are still won and lost mostly in the corners. Practice corners by doing circles or figure eights to get better with the clutch, brakes and throttle control. Practice riding berms and ruts to get comfortable in them. Do not watch your front wheel or you will pop out of the rut or berm every time. Practice looking ahead or further down the track. This will make you faster and make you a safer rider. Motocross is kind of like golf and tennis. Learning proper form early will make it easier in the long run. Keeping the elbows up and learning to stand up on the bike are very important. Learning proper body position will help you save energy and make you a safer rider because you will be in better control of your machine and will be able to respond easier to what the bike does when it hits ruts, bumps and holes on the track. Watch faster riders when you go to practice and try to copy what they do. Most experienced riders are happy to offer riding tips because they had help when they were learning. Try to find someone that is close to your speed, maybe just a little faster and ride with them. Have pretend races for a set period of time and ride it like a race. Even if you fall off, get up and keep riding until the time is up just like you would in a race. Lets start with a list of what you need to bring. The more parts and tools you have the better your chances of being able to race after a fall. Other racers are very generous and helpful when another rider has problems but there is not always time to find someone that has the parts you may need. Above all …. expect to be nervous. It is natural. Riders that have been racing for years still get butterflies on race day. The secret is to accept that as a part of racing. When you go to the track for your practice get there early so that you won’t feel rushed. When you are about to ride concentrate on taking some deep breaths and stretching before going out on the track. Try to watch as much of the racing as you can so that you can see how other riders are doing different sections and obstacles. When you go out to ride concentrate on not riding over your head. It doesn’t matter whether you only a race a couple of times in your life or if you are the future Ryan Villipoto, you will only have one first race. It is rare that riders win their first race so just try to relax, learn and have fun. Start the night before by going over your checklist and making sure you have everything organized and ready to go. On race day load up early so that you don’t feel rushed. You should already have directions and know how long it should take you to get to the track. The first thing you will have to do when you come into the track is to buy an entry pass for everyone in your vehicle plus pay a camping fee if you decide to stay for the night. You will also get a rider information sheet. This sheet will cover basic information for that day’s race and will list upcoming events, etc. As soon as you get parked take a few minutes and read it. Where you park is a personal preference. At most tracks there is parking next to the race track. Some riders look for shade if there is any. Others prefer to be as close to registration as possible. When you park make sure you are not blocking any driveways or fire lanes…. they are usually marked by a row of fence posts or stakes. To find out where rider registration is located, look for the local club sign-in trailer, which is usually, located right near the finish line. CMRC Annual Memberships or Day Passes will be available at the track. Membership can be purchased at the trailer on race day. Riders under 18 years of age must be accompanied by a parent/guardian or another adult with a notarized statement authorizing them to sign for the minor, no exceptions. Fill out a registration form and a minor release (under 18 only). Be sure to write legibly and then sign the forms. Sign in is from 6-9pm on Saturday night and from 6:00-7:45am on Sunday morning. Please take the possible line ups into consideration when choosing to show up at 6:58am Sunday morning. Anyone showing up after 7:45am for sign in will be charged and extra $10.00 a class so if your classes are $30 each and you race 2 classes, be prepared to pay $120 instead of $60. There will be no exceptions or exclusions so govern yourself accordingly when it comes to the amount of time needed. After you have signed in, go back and unload your bike and set up your pit. Look over your bike and get it ready for your practice session. *NOTE* If you need your entry fees refunded due to bike malfunction, injury, etc this must be done BEFORE PRACTICE STARTS. Not your specific practice, all practices. Entry reconciliation, payout, rider lists, qualifiers, etc. are all based on numbers and once that’s figured out, even 2 entries can make a huge difference and cause many unnecessary re-calculations. NO REFUNDS ONCE PRACTICE HAS STARTED. When you have everything set up, go walk the track. Track walk is only open prior to practice starting. This will help you relax as well as learn the track. Take time to look at the different obstacles. Find a high spot and stand and look at the track like you are watching a rider go around it while they are racing. This will help you learn the layout. Take your time. The Mandatory riders meeting is at 7:40 am. There is a random riders roll call…so if you’re not there, you get penalized. Get somewhere near the PA speaker so that you can hear. IF there are any changes in the race order they will be announced. If there are any problems that have come up they will also be addressed. Following the riders meeting there will usually be a prayer and then a short break. Riders in the first couple of practices need to work their way to the start gate during this break. The practice order will be announced at the riders meeting and practice will start at 8:45am. The race order will be made up and posted during practice. About 30-45 minutes before your practice, start getting dressed. Check the gas in your bike and then warm it up. Do not pull into the staging lane until it is time for your group. Remember to take some deep breaths and stretch to help you relax before going out on the track. Use the practice session to learn the track and warm up. Try different lines so you will know what to expect if you need to take them later. Pay attention to the track flags. Be sure and hold your line (don’t zig-zag) so that faster riders can pass you. Don’t worry about racing with anyone and remember not to ride over your head. When you are flagged off the track, slow down to 5 mph (first gear) as you exit. It is easy to go too fast because you are nervous and have a lot of adrenaline flowing. Calm down and take some deep breaths again. Go back to your pit and look your bike over. Refuel and lube the chain. Relax and drink something. If you are done, then go to the results board and write down the race order. Watch some other groups. When you get up on the starting gate leave your bike shut off until the checkered flag comes out for the class currently racing on the track. Start your bike and make sure the gas is turned on. The 30-second board will go up and scan all of the riders. If you are having problems starting your bike or?? Let the starter know by waving your hand. You will get 2 minutes to correct the problem. If everyone is ready the board will be held up for 30 seconds. The starter will then flip the board over to reveal the 5-second board. The gate will fall 2-5 seconds later. Sometimes if there are several small classes that can be run on the track at the same time they will be combined and scored separately. If they are very small they leave the gate at the same time. If there are enough riders then the classes will be stagger started. One class will leave the line, the gate will reset and then the second class leaves. Staggered starts are usually marked on the race order with bold print or slash marks ( /) between the classes. If you are supposed to start with the second group and you start with the first you will be penalized. Don’t get excited and start with the wrong class. The second group must be ready when the card goes up for the first group. Qualifiers are used to determine gate pick for the mains. If there are more riders than will fit on the starting gate these qualifiers will be used to narrow the field down to a full gate. Depending on how many extra riders are in the class there will either be a last chance qualifier (LCQ) or the extra riders will get to start on either side of the starting gate. The qualifiers will go very quickly so be sure and keep up so you don’t miss your race. Shortly after your qualifier the results will be posted on the posting board. It is each rider’s responsibility to check the results for errors and notify the score clerk if there is a problem so it can be corrected. Once the results have been posted for 30-minutes they will be official unless it is changed because of a protest that came during the 30-minute protest time. Riders get gate pick for the main based on their qualifier finish position. There is usually an intermission between qualifiers and mains. Parents are allowed on the track while the 4-6 year old 50cc classes are running. However if a parent interferes with racing, intentionally or not, they risk having their rider penalized and/or losing track side privileges. Remember that your child is not the only one racing. Constantly crossing the track while racing is underway will be discouraged. Parents that verbally abuse their child or act in an unsportsmanlike like manner will be reprimanded. Remember that racing is supposed to be fun. The mains are what count for awards and series points. After the mains the results will be posted on the board just like for the qualifiers. There is also a 30-minute protest time for the mains. Please check the posted results before coming to pick up your awards so that if there is a mistake it can be corrected. No awards will be given out until the protest time for a class has expired. The number of awards and protest time should be posted. Here are some rules which may apply to a MX event. IT IS THE RIDER’S RESPONSIBILITY TO BE TO STAGING EARLY AND TO BE READY TO RACE. Races will go very quickly, especially in the heat races. Races will not be held for missing riders unless we are notified that they are trying to correct a problem at which time they will get two minutes to correct the problem. This is explained more below. It is the rider’s responsibility to check their gate loop. After you have picked your gate inspect it to make sure there are no dirt clods or rocks under any part of the gate loop that will prevent it from falling. Check the gate loop to make sure it is working freely and that no pins are missing on either side, which can cause it to bind. If the race you are in has several classes running and there is a slash mark between them on the posted race order; this means there is a staggered start. Listen carefully to the start gate personal so you will know which group you start with. If you are supposed to start on the second gate and you start with the first group by mistake you will be penalized one lap unless you pull over and let your entire class by. Even then there can be a penalty assessed. When the white flag comes out for the race before yours, it’s time to start getting ready for your start. Make sure your fuel is on and get your goggles ready to put on. The starter’s board can go up before the last rider is off the track so watch the start board person. The starter will scan the bikes on the line with the start board to make sure there are no problems. If you are experiencing a problem wave/raise your arms or somehow get their attention to notify them that you are having problems. The starter will hold up two fingers to let the other riders know there is a problem and the two minute clock will start. After one minute has passed the starter will hold up one finger if the rider is not yet ready. About 50 seconds later the starter will point down the line again to let riders know the race is about to proceed and they should put their goggles on etc. After the starter has checked the line the 30-second board will go up and then the card will go to the 5-second mark. The gate will fall 2-5 seconds later. If there are no problems that make a “hold” necessary, then this procedure will all happen in about 15-30 seconds. There will be only one 2-minute hold per class. If we have reason to believe that a rider is holding up the start without a legitimate reason we will not hold up the races. If the race is a staggered start, only one card will be shown for the second class. There will be no holds for a second gate so make sure you are ready when the first class is about to leave. Riders cannot back off the gate more than 18 inches. If you jump over the start gate you will be penalized. No one is allowed in front of the starting gate and no digging tools are allowed behind the gate. Blocks are allowed for shorter riders but please remove them as soon as your class leaves the line so they will not interfere with the next class. When the yellow flags are out it indicates there is a problem in this area, riders must be in control of their machine and use caution!! NO JUMPING or PASSING will be tolerated! If you hit a rider, a track worker or a medic, you risk being disqualified or penalized. When the Red Cross flag is out there is a rider receiving assistance or there is a dangerous situation on or near the race track. Riders must use extreme caution in that area. NO JUMPING or PASSING will be tolerated! Do not race to the flag. Do not take any chances. If you ride in a way that a track worker or EMT believes to be unsafe the referee can penalize you. Penalties range from being docked positions to being disqualified. If at any time a rider leaves the marked, designated race track, and/or misses an obstacle, or cuts to the inside or runs outside of a corner, and they do not go back and re-enter the race track at that point, or at a point before they ran off the race track, they can be penalized positions. Riders will not automatically be penalized positions unless they either gain positions or they are protested by a rider from within their class within the protest time and we feel they gained an advantage. Allowing another rider to ride under your name will result in disqualification and possibly suspension from participating in local events for both riders. Riders are responsible for checking their results after each heat and main and making the referee or clerks aware of any problems within the 30-minute protest time. Results are official after they have been posted for the 30 minutes unless someone brings a problem to their attention and it is corrected. This includes fighting, obscene gestures, profanity, and/or dirty riding. These will not be tolerated and riders and/or pit crew members can be penalized, disqualified, asked to leave the facility and/or suspended or banned. If you are confronted by anyone do whatever you have to do to get away and notify the referee immediately. Riders will be held responsible for any and all actions of their pit crew, friends and/or families. 1. Learn to service your own air filter. This and being consistent with your premix are two important things that you can do to keep your bike running trouble free. 2. Loosen your front brake and clutch lever mounts enough that you can hit them with your hand to pivot them on the handlebars but tighten them enough so they will not move around while you are riding. This can help keep the brackets and levers from breaking if you fall. 3. If you bend a lever take it off and put it on a hard flat surface and tap it with a hammer to straighten it. Replace it with a new one as soon as you can and keep the other one as a spare. 4. Do not fill your gas tank completely up. A full tank will last 35-45 minutes of riding. Running a third of a tank should be enough for a 12-15 minute race and will shave as much as 10 pounds of extra weight. Experiment when you are out practicing and mark a level to fill for racing. 5. Tire pressure can make a big difference in how your bike will hook up. Talk to other riders to see what they are running for each track, different track conditions, and tire compounds. 6. If it is muddy spray WD 40, silicone spray, or Pam cooking spray on your plastic and riding gear. This will help the mud fall off and make clean up easier. DO NOT spray on your seat or gas tank. You will slide all over will not be able to grip the gas tank with your legs like you should.